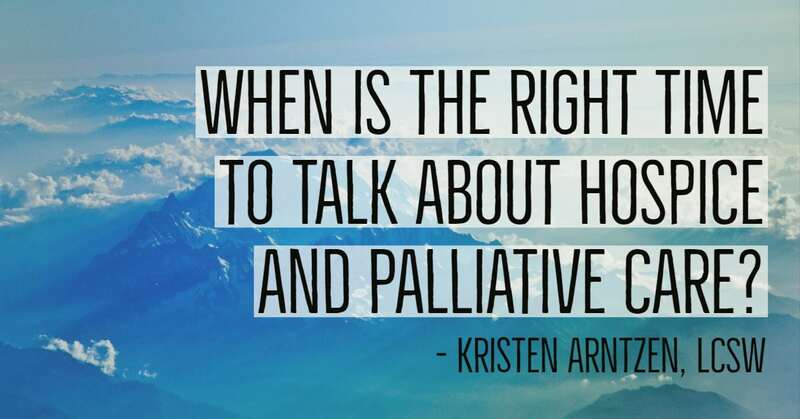 When is the Right Time to Talk about Hospice and Palliative Care? Talking openly about options paves the way for families to really see the choices I’ve spent my career in social work, and I learned early on about the value of serving others. When I first went to college, I worked as a care provider with the elderly in facilities, as well as disabled children and adults in their homes. In these settings, I saw first hand that the full-time job of both the patient and their families is centered around the person who is sick, and it’s a legitimate battle to get them care that they need and deserve. Sometimes that battle, combined with our general aversion to discussing death, makes it very hard to see when to change the conversation from aggressive interventions to palliative support. People hear the word hospice and think that means giving up the battle and admitting defeat. I think this could not be further from the truth. Avoiding the topic of what comfort is, or the talk of what a good death is, can be the greatest disservice to the dying person. In my life, when I get uncomfortable and want to run away, that’s where the real focus needs to be. It’s generally a clear sign that this is something that truly needs talking about. And often, that’s where the opportunity for real happiness is revealed. Hospice is an opportunity where we can redefine the rules of what the battle is about. With all that said, when is the right time to talk about hospice? I think the best time to open a conversation about hospice is anytime there is a change in the lives of loved ones around us. When a chronic diagnosis is made, or a dear relative becomes ill, or a friend unexpectedly passes away. We are then in a place to be open with ourselves and ask what we want for the end of our own lives. I admit it, this is scary. These events mean admitting that living forever is not possible. When hearts and lungs are not doing their job as well, when cancer is discovered, or when memory starts slipping away a little too easily, these events mean honestly talking about what we want, and what we have to let go. Hospice Care and Palliative Care mean comfort. They mean removing pain and suffering. Letting go is so hard, but in the end we are all asked to let go of something, such as the future you imagined; the person you knew; the life you built; and most difficult of all, oftentimes, is letting go of the battle you have fought. It shifts into a battle for quality time, however much of that remains. It is also an opening to a new approach, a different kind of battle, where you have a discussion about what options are available and when to effectively use them. Even if you don’t use hospice for many years, opening the door to having an honest conversation can turn those years into more – more feeling alive, more valuable moments, and more of a sense of comfort and peace. Talking openly about options paves the way for families to really see the choices are theirs, and allows the patient and family to know that every decision is made with their goals and values in mind. Hospice Care and Palliative Care mean comfort. They mean removing pain and suffering. Opening the conversation to what goals are most valued is not giving up, but is allowing us to say out loud what it means to choose the goals that matter most, then finding out what you gain through choosing the truly noble battle: More quality time – together.